The SSC CGL 2017 notification is out. SSC is one of the most famous competitive exam for people around the county, who are looking for government jobs. Thousands of job vacancies are declared by Staff Selection Commission every year. SSC Combined Graduate Level jobs are one of the favorites government jobs among the aspirants. Thousand of applicant were waiting eagerly this year for SSC CGL 2017 notification to get recruited in reputed government organizations. As our country is developing every year with a very fast rate, government jobs opportunity is increasing with a much faster rate. The non-gazetted posts of central government are filled by this exam. Aspiring candidates can try their luck in 2017 exams, as there is still enough time to prepare for exam. The SSC CGL 2017 notification is about to come out for 1000’s of jobs. For CGL 2017 notification, we will have to wait for couple of days as it will be out on 16 May, 2017. The notification date for SSC CGL 2017 was announced in revised SSC calendar 2017, released on 10 April. SSC CGL Recruitment will be started after the declaration of 2017 results. SSC CGL Exams will be conducted between 1 to 20 August 2017, opening date of applying online for SSC exam is 16 May and last date of applying SSC CGL 2017 is expected to be 16 June, 2017. The exams date will be after couple of months. Lakhs of aspirants were waiting for SSC CGL exam notifications. It will open up path for all of them, to achieve their dream of becoming a government official. SSC CGL is one of the biggest opportunity for people preparing for government exams. Those who could not score good in SSC CGL 2016 have a very good chance in this year’s exam. The notification of SSC CGL exam will be out on 16 May, 2017. It will contain Combined Graduate Level vacancies, posts, number of posts, CGL grade pay scale, SSC CGL 2017 eligibility, exam fee, etc. The Combined Graduate Level CGL result 2017 will be declared after couple of months, once the SSC CGL Tier 1 exam is conducted. There are many assumptions related to SSC notification. Many sources are claiming that 20000 vacancies will be there, some are saying that around 15000 vacancies will be there this time. We might see some effect of demonetization, which increased the need of more staff in certain departments including Income Tax Department. The notification will have a tentative list of vacancies within it, however the final list will be shared only after SSC CGL 2017 final result. The SSC CGL Notification is out and it has all the important information required for aspirants. The notification can be downloaded here : ssc-cgl-2017-notification.SSC CGL 2017 notification is on the cards and the day of announcement was 16 May. SSC has shared the details about all the important details regarding this big exam. The official notification is out, as per the information given by SSC. During last few years, SSC has declared notification in first quarter of the year, however they have also delayed it till May in 2015. The notification was expected to be out earlier this year. SSC has Delayed the notification and they have made some changes happening in examination this year. The Tier I exam time is reduced from 75 minutes to 60 minutes. So we can expect some changes in SSC CGL exam pattern, Syllabus 2017, exam conducting body (due to recent issues faced with Sify). The notification will clear some of the doubts and some will be with us for some time. 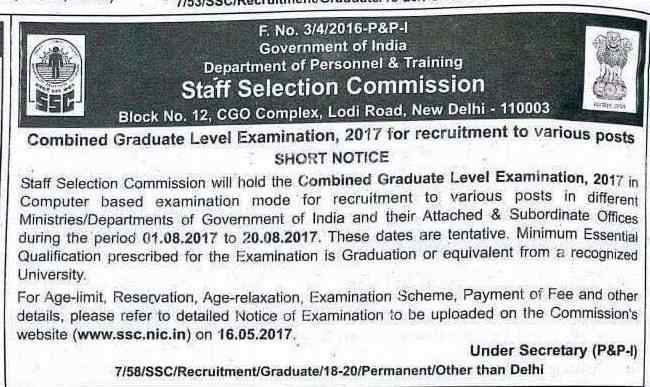 The Staff Selection commission has shared a short notice in newspapers, confirming the date of 16th May for notification. They have also kept the tentative exam date of 1 August to 20 August. The notice has just provided the final date of detailed notification, along with minimum education required, which is graduation or equivalent from a recognized university. However, the detailed age limit, relaxation, exam fee, syllabus, etc will be shared on 16th May. The exact vacancy detail is not out yet. We need to wait until the final vacancy detail is shared by Staff Selection Commission. The CGL stands for Combined Graduate Level. It itself depicts that this examination is conducted for candidates having completed their graduation or equivalent degree. Apart from this, few other criteria which are required to be fulfilled by any candidate. Educational Qualification: Graduate or equivalent Degree. Citizenship: Only Indian Candidates are eligible. Physical Fitness Requirements: Few physical fitness requirements needs to be fulfilled for some of the posts. The age limit varies for various post and reservation quota. Check below table for detailed age limit for CGL. Age relation given by Staff Selection Commission to different category is listed below. The exam syllabus is shared in the notification released by CGL. SSC has delayed it by couple of months, so we suspect that there might be some changes, including syllabus. So better to wait and watch, what SSC has in their box, and start preparing accordingly. The exam pattern of SSC has been divided in four parts, candidate needs to clear all levels to be selected. Tier I and Tier II exams are conducted by online mode. The selection pattern might be changed in upcoming notification. It is better to keep the preparation according to latest SSC exam pattern. The exam centre of SSC CGL is filled during SSC application form filling. According to the location priority provided by applicant, SSC allocates the exam center. The exam center is provided in the SSC admit card, shared by Staff Selection Commission. The list of exam centers will be shared by commission with the notification on 16th May. Early filing of SSC form might increase the chances of preferred exam city. We will share the exact and complete details after the release of notification on 16th May. We will share the link of SSC CGL 2017 notification pdf after the official announcement of the exam.